Aerodynamicists use wind tunnels to test models of proposed aircraft and engine components. During a test, the model is placed in the test section of the tunnel and air is made to flow past the model. Various types of tests can be run in a wind tunnel. Some tests are performed to directly measure the aerodynamic forces and moments on the model. The most basic type of instrument used in this type of testing is the force balance. We must measure six components, three forces (lift, drag, and side) and three moments (pitch, roll, and yaw), to completely describe the conditions on the model. But for some tests, only three components (lift, drag and pitch) are measured. In some wind tunnels, the measuring devices are located external to the model and the test section. In other tunnels, the measuring devices are placed inside the model. The location of the device affects the choice of mounting system for the model and the data reduction necessary to determine the aerodynamic forces. On this web page we will examine the internal balance. 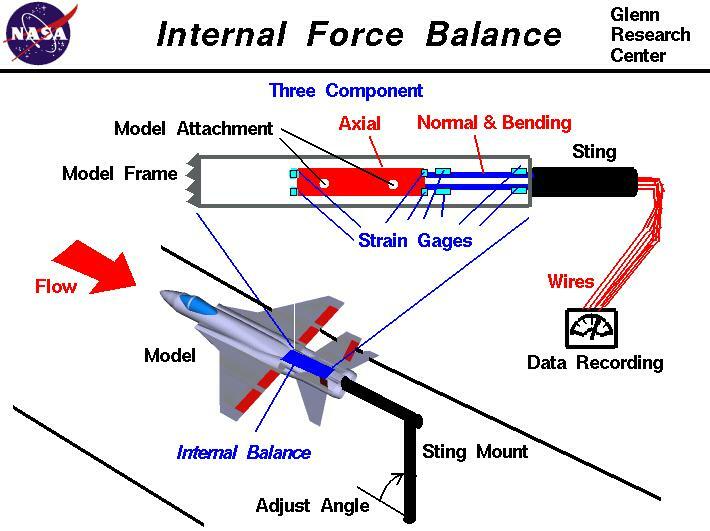 As shown in the lower left of the figure, an idealized fighter plane model is attached to a sting and placed in the test section of a wind tunnel. At the top of the figure we show the details of the model attachment to the sting. The model is actually attached to a three-component balance system and the balance system is attached to the sting. The three-component balance can detect the axial and perpendicular, or normal, forces and the bending along an axis perpendicular to the axial and normal axes. From these measurements one can derive the lift , drag , and pitch of the model, but cannot determine the side force, roll, or yaw. Forces on the model are detected by strain gages located on the balance. Each gage measures a force by the stretching of an electrical element in the gage. The stretching changes the resistance of the gage which changes the measured current through the gage according to Ohm's law. Wires carry electricity to the gages through the hollow sting and carry the resulting signal back through the sting to recording devices in the control room. Multiple strain gages are arranged on the balance to account for temperature changes on the model during the test. A Wheatstone bridge electrical circuit is used to provide temperature compensation. Because this example uses only a three-component balance, the model must be aligned with the flow in the tunnel to eliminate the side force, roll, and yawing moments. We can only vary the angle of attack of the model, as shown at the left bottom of the figure. With an internal balance, the forces are measured in a co-ordinate system attached to the model. The resulting measurments must be corrected to produce the lift, drag, and pitching moment in the tunnel co-ordinate system. When using a sting with an internal balance, the aft geometry of the model is often modified to accept the sting. Additional tests may be required to determine the final aircraft drag with the true aircraft geometry.